There was a time when I used to play a lot driving and racing games on my computer and I had a lot of fun playing them. I was never really that good at driving the cars but even crashing them and flipping them over was fun in itself. The difficulty came when I started having trouble using the keyboard to play. I solved that for a while with a gamepad with dual analog joysticks but after a while that type of controller stopped working for me as well due to the weakening of my hands and the tightness in their tendons. I pretty much gave up on the racing games and focused on things I could play with my mouse. While there are plenty of games that work with only a mouse, none of them were in the driving genre that I have enjoyed the most. The solution I have found not only works for driving games but also first person shooters and most other genres of video games. However, it was not working out for me because PPJoy is not easily compatible with my 64-bit version of Windows 7. To get it working you have to put Windows 7 64 in an unsafe test mode so the unsigned drivers will install. To make it worse every time I tried to even download the program my anti-virus program mistakenly thinks PPJoy is a Trojan horse computer virus and would remove it immediately. Anyway, I made the changes to Windows and disabled my anti-virus program to install it and I couldn’t figure out how to set it up with GlovePie. I was uneasy with leaving my computer at risk for the sake of playing a game so I removed the software and reverted my computer back to normal. If you have a 32 bit version of Windows 7 or an earlier version of Windows like XP or Vista then PPJoy and GlovePie may very well work for you but just know that it is not easy to set up. After I gave up on PPJoy, it occurred to me that maybe I had gone about this all wrong. 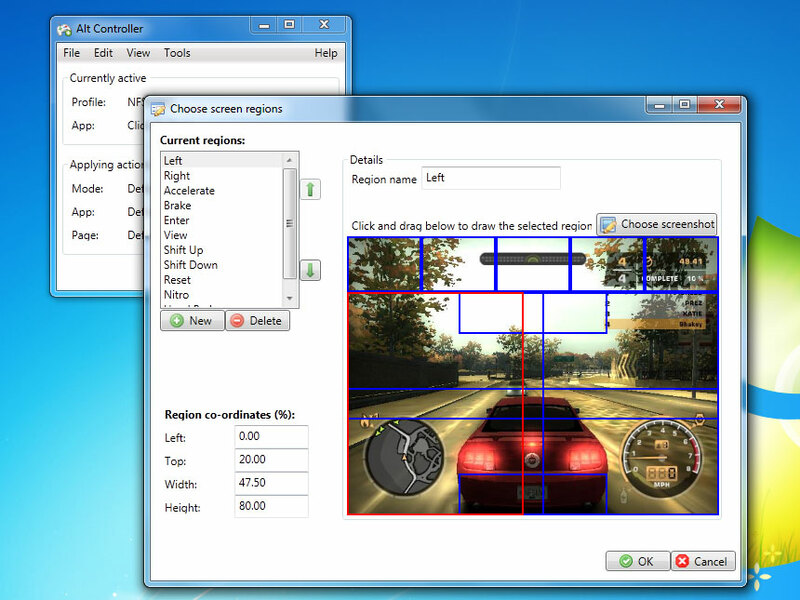 Most of the driving games can be controlled by a keyboard which is not a proportional joystick-like controller. So I searched for a keyboard emulator that could be operated by a mouse and in no time at all I stumbled upon a program called Alt Controller created by a guy for the exact purpose I was looking for and the best part is, it is freeware and completely compatible with nearly all versions of Windows. I thought I would give Alt Controller a try with the demo of Need for Speed: Most Wanted I had downloaded. Alt Controller hand a profile for this game already which is great. By default it was only setup for just turning and accelerate and brake. But after studying the program I have added the ability to control every part of the game. Alt Controller works by creating invisible hotspots on the screen that activate a key on the keyboard when you hover the cursor over each particular hotspot. You can also assign mouse buttons to activate other keyboard keys. After Alt Controller was set up the way I wanted it, I gave it a try and it works great. After several tweaks I am able to play the game with no limitations. Well… that is to say no physical limitations, I‘m still not a good driver but there are still the awesome crashes and flips! To learn more about Alt Controller, see it’s official web page on SpecialEffect’s accessible GameBase. 😆 way wicked cool! Someday I will be as smart as you. Have fun!!!!!! You are a study in paitence and perseverance…Just let me know when you are on the road! !